This past weekend, I discussed the correction last Friday as concerns over “Turkey Turmoil” grabbed headlines. “The market did indeed attempt to test all-time highs this past week, but, as noted, the overbought condition provided the fuel for a correction given the right catalyst. The reality, however, is that nothing has been “fixed” with respect to Turkey, and as I noted in the newsletter, the backstop of Federal Reserve liquidity which supported the markets during the “Greek Crisis” does not exist currently, in fact, it’s running in reverse. But therein lies the danger. Despite the bullish short-term optimism, longer-term conditions currently persist which have led to extraordinarily sharp market reversions in the past. Regardless, the market is currently ignoring such realities as the belief “this time is different” has become overwhelming pervasive. Importantly, such levels of exuberance have NEVER been resolved by a market that moved sideways. Importantly, traders are once again piling into the same trades on several fronts which we can see by viewing the “Commitment of Traders” report data. Non-Commercial Traders: this group consists of traders that don’t use futures contracts for hedging and whose positions exceed the CFTC reporting levels. They are typically large traders such as clearinghouses, futures commission merchants, foreign brokers, etc. The data we are interested in is the second group of Non-Commercial Traders. This is the group that speculates on where they believe the market is headed. While you would expect these individuals to be “smarter” than retail investors, we find they are just as subject to human fallacy and “herd mentality” as everyone else. Leading up to the January peak there had been a pervasive speculative short position in volatility. In early February, those “shorts” were forced to cover in a spectacular fashion leading to a sharp reversion in early February and into March. However, that “fear” soon subsided and it didn’t take long for those plagued with “recency bias” to engage in shorting volatility once again. Currently, speculative net short positions have once again grown sharply over the last couple of months despite the fact the market has been unable to break out to new highs. Given the right catalyst, reversals of net-short VIX positioning have previously resulted in short to intermediate-term declines. More importantly, the recent pop in volatility was confined to the cyclical downtrend in overall market volatility. What we need to be watching for is the reversal of the long-term cyclical downtrend into the next cyclical uptrend. With volatility extremely oversold on a monthly basis, it is worth noting that reversals have been violent with “no quarter” given to investors. The rise in crude prices from the lows has also been primarily responsible for the uptick in both economic growth and inflationary readings. However, higher oil prices are also a “double-edged sword” which also acts as an additional tax on consumers as well as corporate profit margins. The push above $70/bbl led to a massive surge in crude oil speculators chasing price but also provides the “fuel” for a sharp reversal as well. For investors, it is also worth noting that crude oil positioning is also highly correlated to overall movements of the S&P 500 index and earnings growth. With crude traders currently extremely “long,” a reversal will likely coincide with both a reversal in the S&P 500 and oil prices being pushed back towards $55/bbl. While oil prices could certainly fall below $55/bbl for a variety of reasons, there is reasonable support around $50-55/bbl barring an economic recession. Given the extreme long positioning on oil, a reversion of that trade will likely coincide with a “risk off” move in the energy sector specifically. With oil at extremely overbought levels, the historical tendency has been a reversion back to the long-term moving average which also coincides with the support level of $50-55/bbl. Following the equity rout in February, money has flowed into the U.S. dollar, as we previously suggested, as global investors searched for safety. The reversal in the dollar has also helped importers profit margins despite tariffs from the current Administration. However, a stronger dollar also hurts exporters as it increases their costs to foreign consumers. Given exports make up roughly 40% of corporate earnings, look for a strong dollar to be an excuse used in many forthcoming earnings reports. As shown above, and below, with long-dollar positioning increasing, it suggests the dollar likely has more room to run in the short-term. Currently, the dollar has completed a 50% retracement from the recent lows. Our current target on a rally is 97.63 on the index but any further weakness in the S&P 500 or a global economic event (like Turkey) could easily push to the dollar back to the highs from last year. It is also worth watching the net-short positioning the Euro-dollar as well which has also begun to reverse in recent weeks. Historically, the reversal of the net-short to net-long positioning on the Eurodollar has often been reflected in struggling financial markets. The reversal is still early, but worth watching closely. One of the biggest conundrums for the financial market “experts” is why interest rates fail to rise. Apparently, traders in the bond market failed to get the “memo.” The reversal of the net-long positioning in Treasury bonds will likely push bond yields lower over the next few months. This will accelerate if there is concern of a “contagion” from Turkey or a resurgence of a “risk-off” rotation in the financial markets. The chart below shows the periods where “net short” contracts exceeded 100,000. Currently, traders have never been this short Treasuries which suggests a reversal of that positioning would lead to substantially lower interest rates. More importantly, yields are now approaching levels which have historically been significant in relation to major market events. Or, in other words, the market is currently at levels where returns on a bond portfolio have significantly outperformed stock portfolios. As I noted above, with few exceptions, investors are very “one-sided” in their positioning. The overwhelming belief is that stocks and yields can only go up from here. Such overly complacent, and crowded positioning, has had historically poor outcomes. 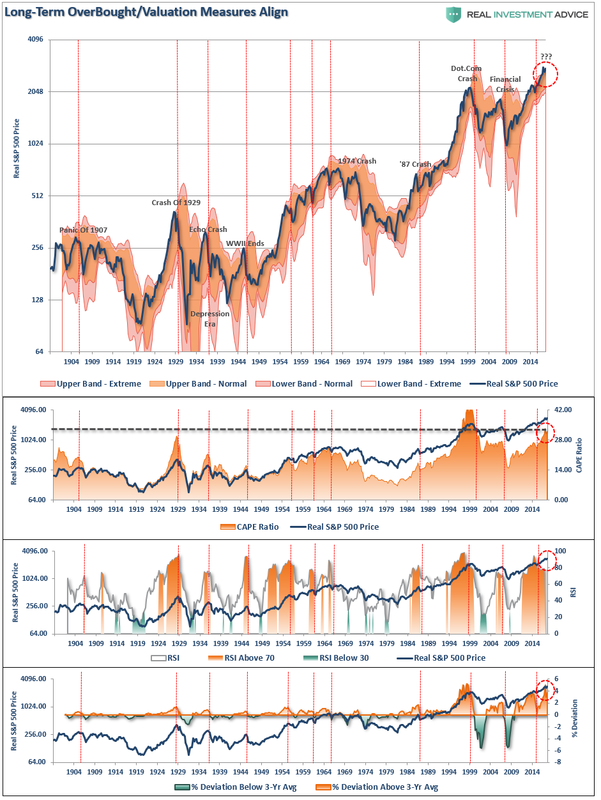 Despite the correction earlier this year, positioning remains extremely bullish across a variety of measures. Not surprisingly, investors continue to believe the market is essentially devoid of risks. The inherent problem with much of the mainstream analysis is that it assumes everything remains status quo. But data, markets, economies, and liquidity are never the same. With the markets still clinging to all-time highs, there seems to be little that can dislodge the bulls currently. Because of this, we remain almost fully allocated to the markets currently. However, we are also becoming much more wary of the risks as we move into the last quarter of this year. Pay attention, have a plan, and act accordingly. Technically Speaking: Are Bonds Sending A Signal?